The National Secular Society has announced the names of six candidates on the shortlist for the Irwin Prize for Secularist of the Year. The award, which comes with a £5000 prize, kindly donated by Dr Michael Irwin, recognises a campaigner or group for an outstanding contribution to the secularist movement. Professor Steven Kettell, for co-ordinating a secular response to the Commission on Religion and Belief. His work helped rebut calls for more religious privilege, and set out the urgent case for a new secular constitutional settlement in the UK. Professor Ted Cantle CBE has been nominatedfor his advocacy of integrated education and social cohesion. He has been particularly vocal in his opposition to the Government’s plan to allow a new wave of faith schools free to discriminate in 100% of their admissions. Asma Jahangir, the former UN Special Rapporteur on Freedom of Religion,for her principled advocacy of universal human rights and her commitment to secular justice. She spent much of her career defending women’s rights, the rights of children and the rights of minorities in Pakistan. Asma has campaigned against Pakistan’s deadly blasphemy law and has been a vocal proponent of human rights in her home country. Houzan Mahmoud and the Kurdish Culture project, for their initiative to provide a platform for Kurdish writers, feminists, artists and activists to advance gender equality, freedom and universal rights. Scott Moore and Let Pupils Choose, a Northern Ireland Humanists campaign,for challenging compulsory worship and religious privilege in Northern Ireland’s schools. 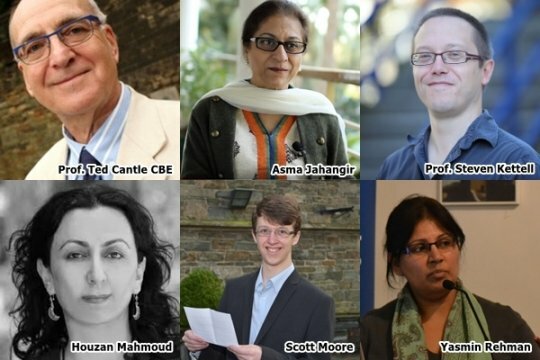 Terry Sanderson, president of the National Secular Society, said “all of these shortlisted nominees have made worthy and commendable contributions to the secularist cause in the last year and we congratulate all of them on their work and achievements. The prize will be presented by the journalist and activist Yasmin Alibhai-Brown.